After a long, cold winter, spring offers a much-needed sense of renewal for all of Mother Nature's creatures - including us. As we open up our windows and dust off our furniture, we naturally feel the urge to bring change into our lives. For us women, that means shopping! Renewing the family wardrobe is a springtime must. And with sunshine and warm days to look forward to, the stores are sure to be filled with pretty pastels, cheery brights and sunny florals. With Easter soon on the way, spring also means picking out a sweet Easter dinner dress for my little gal. I found these two pretty floral dresses while browsing through the kids' section at Sears.ca. And with rain so often in the springtime forecast, I also picked out this cute raincoat that carries on the floral theme. Since he has reached the oh-so-advanced age of 11, my boy doesn't really go in for dressy clothes. For special occasions, I encourage him to wear a tidy plaid shirt like this one from Levi's at Sears. For his springtime wardrobe, we are looking at classic stripes and always-in-style plaid! It never fails to surprise me how much the kids have grown over the winter, hidden as they were under snow pants and heavy coats! Now is a great time to re-stock drawers and closets. 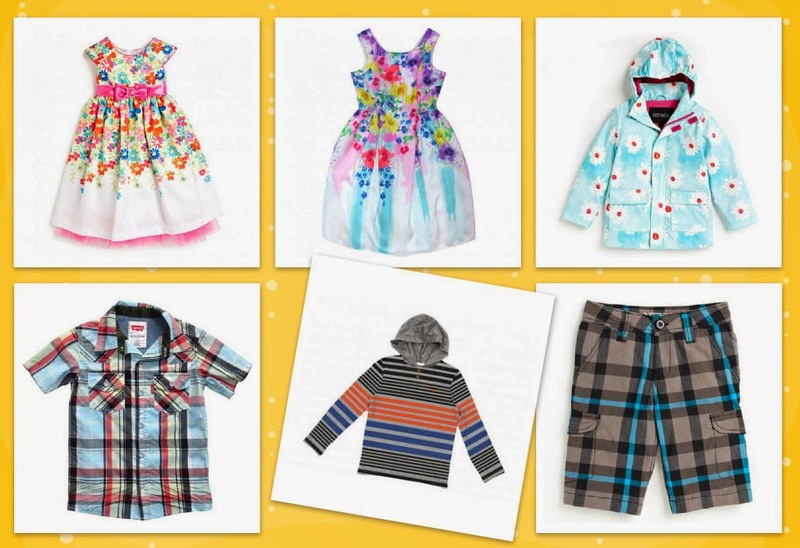 During Sears Days, March 20th to April 6th, you'll find lots of great deals on kids' clothing (and maybe a little something for yourself!). What spring trends are you hunting for this season? Win a Portrait Package from Sears (Worth $244.98)! To celebrate spring fashions and Easter/Passover, Sears Canada is giving away a complimentary photo session and framed specialty product to one lucky Canadian reader. Enter using the rafflecopter below until March 31st. Good luck! *Disclosure: I am part of the Sears Mom Ambassador program with Mom Central Canada and I receive special perks as part of my affiliation with this group. The opinions on this blog are my own. I can't get over how beautiful the Spring fashions are. The girls' dresses are adorable! I already went shopping online! LOL! Online shopping can be dangerously tempting Christine! ;) Thanks so much for visiting! I honestly dont know what new fashions are out for spring for boys. But it will be nice to get out some light, pastel coloured short sleeve shirts for my son to wear. Oh and some new fun rubber boots! My favourite spring style is wide-legged pants! I'd wear it! Floral birkenstocks just like your daughter is wearing in the picture. Yes! I love stripes and plaid for my boys, the busy patterns keep them looking newer longer and hide any stains quite well. I love the plaids! My boys will be wearing them for sure. I love my BOGGS boots, they look like rubber boots but warm enough to wear through the winter!